You can now leave another £25,000 to your descendants TAX FREE! Bereaved Families can expect to pay more in Probate fees from April 2019. Christmas gifts over £250 may incur Inheritance Tax! Here’s what you need to know. Extortionate new “stealth tax” announced in the form of probate fees. 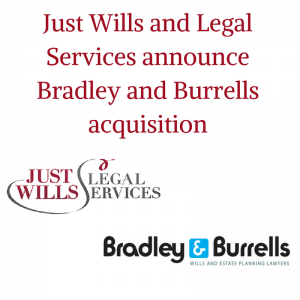 Just Wills and Legal Services Ltd (JWALS) is pleased to announce the acquisition of Bradley and Burrells Ltd and its sister business Willcare UK Ltd, on 17th August 2017. This now brings us to 3 new additions to the JWALS family in 3 years, and includes 20 underlying companies acquired through its acquisition vehicle, PHDM Holdings Ltd. Just Wills and Legal Services is now on track to become one of the largest and most respected businesses of its type in the country. Based in Essex, Bradley and Burrells is a professional Will Writing and Estate Planning Company who work closely with a number of independent legal advisors to offer a full range of Legal services to its clients. The previous owner, Tim Heard, is now planning to concentrate on his Estate planning software business – we wish him the best of luck going forwards. Regulated by the Society of Will Writers, and underwritten by The Professional Association of Legal Services (PALS), which guarantees continuity of service, JWALS strives to provide reliable, trustworthy and high quality legal services to all its clients.